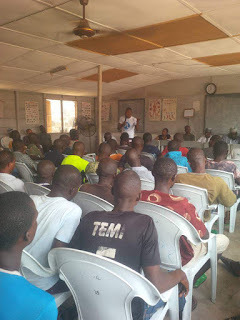 The program started about 10:45am with an opening address from the coordinator, Mr Ahmad Adetola-Kazeem where he enlightened the inmates on the purpose of the organisation as well as the reason for our being there today. He stated clearly that the purpose of our presence today was to motivate the inmates on the importance of being educated or attaining certain skills which will help them become relevant upon their release to the outside world. A welcome address was also done by the Principal of the school. In his address, he encouraged the inmates to attend the school rather than roaming about and waiting to be enticed with food before attending. The Deputy Controller of Prison joined the gathering after this and succinctly spoke to the inmates on the importance of attending the school and having an education. 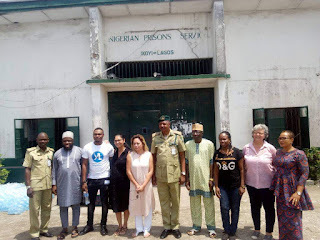 He further introduced another non-Nigerian NGO which was basically involved in prison welfarism in areas of feeding as well as building of better structures in the prison yard. The Controller thereafter commended both NGOs fir their selfless services to humanity. An opening prayer was done by two inmates; a Muslim and a Christian. Afterwards, the first speaker Mr Harrison Gwamishu started on a very lively note, chanting the popular slangs of the prisons which all the inmates instantly resonated with. Mr Harrison who was falsely accused for conspiracy, armed robbery and attempted murder had served four years awaiting trial. He made the inmates understand that it was when he entered the prison that he saw the need to be a better person which prompted him to join the drama group as well as attend school. 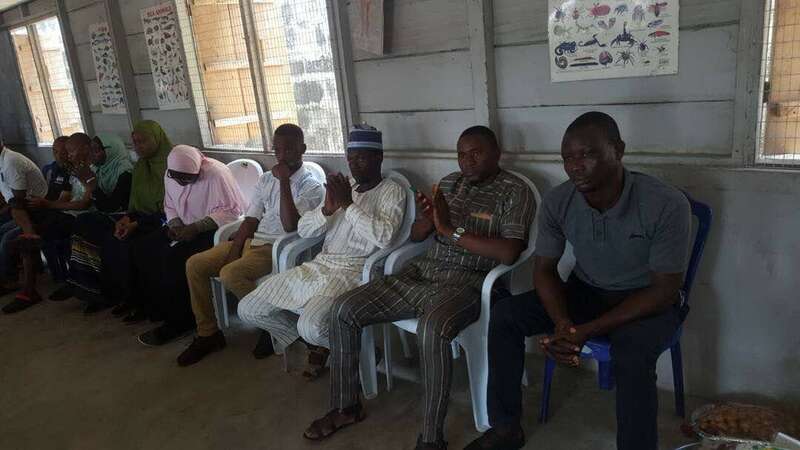 He further said that it was in the very same Ikoyi prison that he took his GCE in 2013 before he was transferred to the Delta prison before he was eventually released. Mr Harrison spoke to the inmates on the importance of empowering themselves through education as that would be their ticket to the total freedom they wish to have. 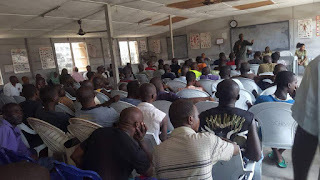 He further explained that planning to commit more crimes upon their release will do them no good and as such, they should ensure they grab the opportunity of free education and empowerment the prison offers. Mr Harrison is now the founder of Behind Bars Initiative which is an initiative aimed at fighting for the rights of inmates. He was also selected for the Mandela Washington Fellowship in the United States. The second speaker Mr Tom was an ex-inmate of the Ikoyi prison and is well-known to many of the inmates. He told spoke to them on the importance of education which he buttressed was one major way of staying relevant in the world outside. 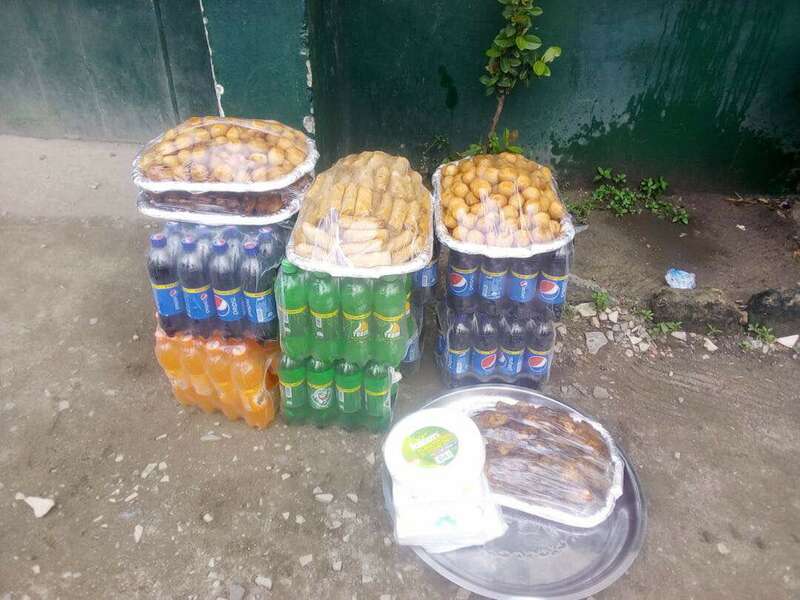 He further informed them that it was as a result of the opportunity to learn skills while in prison that he has been able to successfully start a new business. 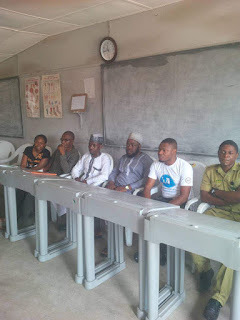 He also stated that it is only by getting an education while in the prison that they can avoid being stigmatized when they leave the walls of the prison. There was about 10 minutes break where the entire audience was thrilled to jokes by Kelvin, a comedian in the prison. After that, Mr Nathaniel Jamgbadi, the third speaker, who is a retired banker and a financial consultant who was also falsely accused and spent two years awaiting trial at the Minna prison. He spoke very briefly on deciding who they want to be. He advised them to ensure they do not take negative qualities out of the prison and to do this he said, begins with them gaining knowledge and skills. He further told them that this period was the best time to empower and equip themselves for the world outside. Mr Babagana who was an ex-inmate at the Kirikiri maximum prison for being accused (falsely) of being a Boko Haram member, shared his experience on how and what led to his arrest and detainment. 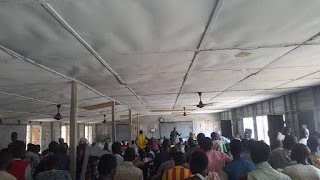 He further informed them that he learnt the importance of furthering his education while he was in prison and how he also participated actively in teaching others what he knew. He advised the inmates to strongly improve on their spirituality as nothing was impossible with God. 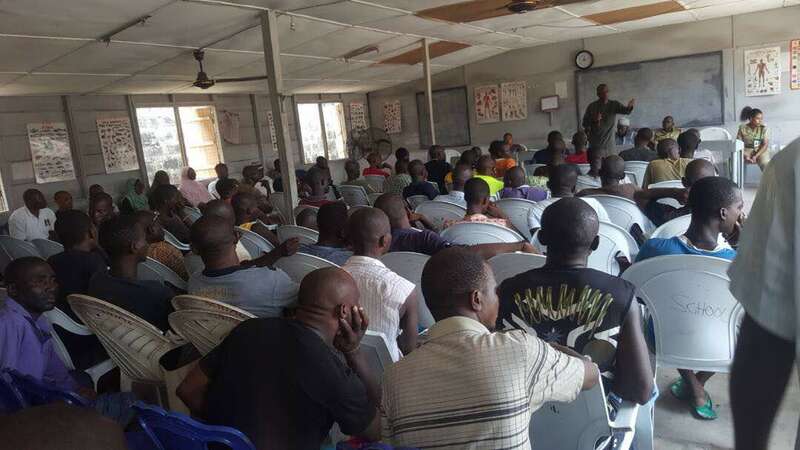 At this juncture, an inmate, Paul Adeoye spoke to the other inmates about the importance of changing their mind-sets first as that would be the only way they would open up to learn. Paul is now a part 2 student of the National Open University of Nigeria studying Entrepreneurship and Business Management and he confessed that the best decision he ever took was making up his mind to take the GCE in prison. The meeting ended with distribution of snacks and drinks which led to a lot of drama and elation from the inmates. 226 inmates attended the invent. The closing remarks and answering of questions was done by the Coordinator and the program came to a close at about 1:25pm.